The computer program SETOFF analyzes foundation settlement of both, shallow and deep foundations, using commonly-accepted procedures. The total settlement of a foundation is generally composed of two parts, elastic and consolidation settlement. Elastic settlement occurs because of the pseudo-elastic nature of most soils and it occurs immediately on application of the foundation load. Consolidation settlement takes place as the pore space in the soil is reduced under the foundation loading and it may require a period of time to be fully developed. The elastic settlement may not be important because it takes place during construction as the structural loads are added. Because of this, some compensation for the elastic settlement may take place during construction. This does not mean, however, that elastic settlement should be overlooked. 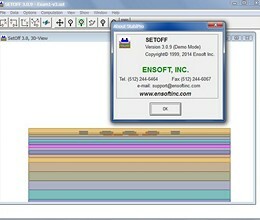 For the above criteria, SETOFF computes the settlement under 100% consolidation (without elastic settlement that occurs during construction, which can be calculated by other programs like APILE and SHAFT), but will not provide the information for the percentage of consolidation versus time. * SETOFF download link provides demo version of the software. No one has rated SETOFF yet. Be the first to rate this product.